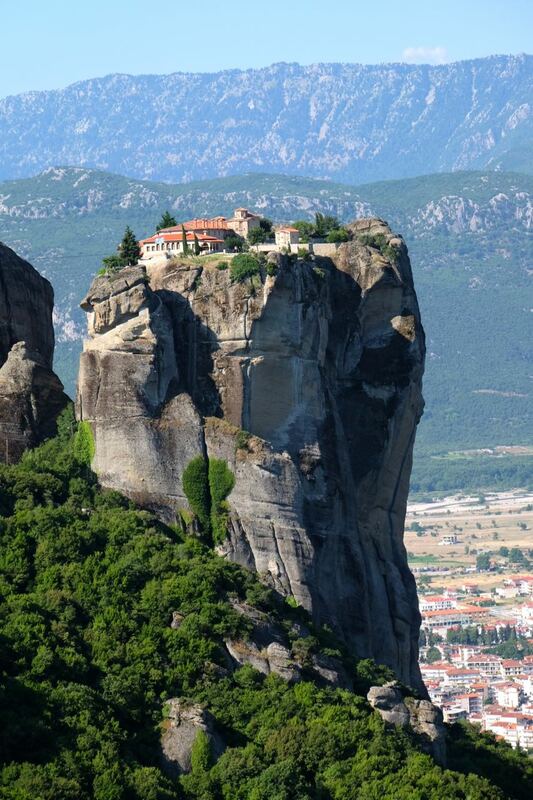 Meteora means “suspended in the air” in Greek. 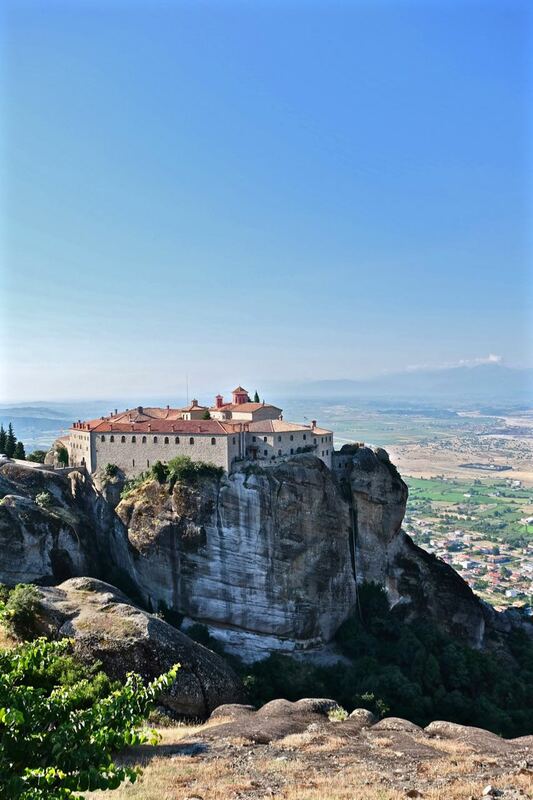 Greek Orthodox monks first settled in this area in Central Greece in the 11th century. 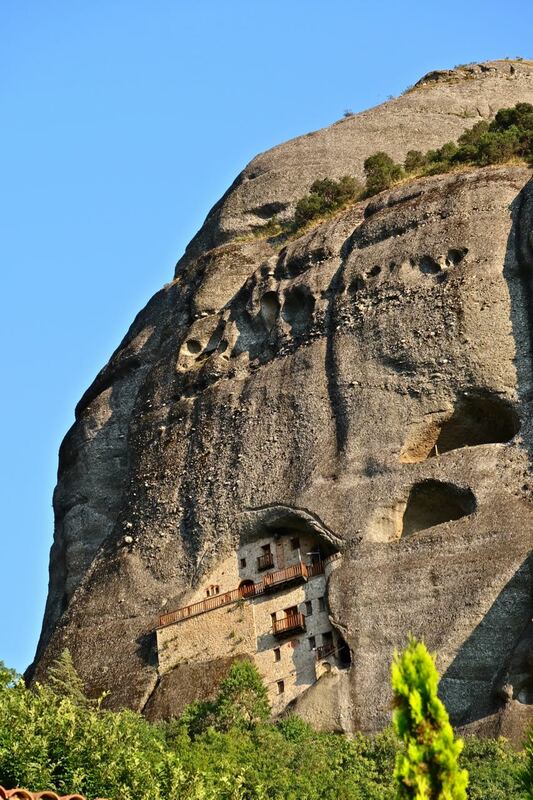 The first hermits built simple dwellings in hollows and fissures in the rocks and lived in solitude. Then monks started building monasteries on top of these sandstone columns. These monasteries were built under almost impossible conditions with the materials carried up by monks scaling these sandstone columns. 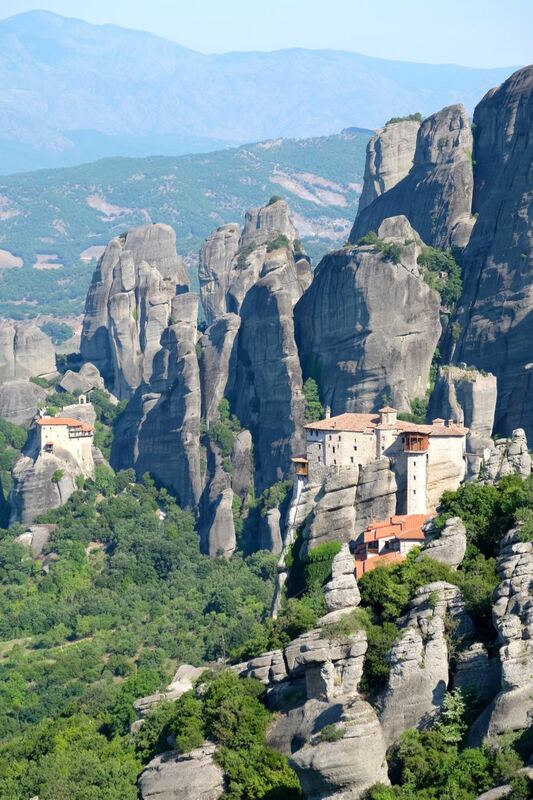 There were originally 24 monasteries perched on these sandstone peaks, now only 6 remain, namely The Great Meteoron, Varlaam, Rousanou, St. Nikolaos, St. Stephen, and Holy Trinity. 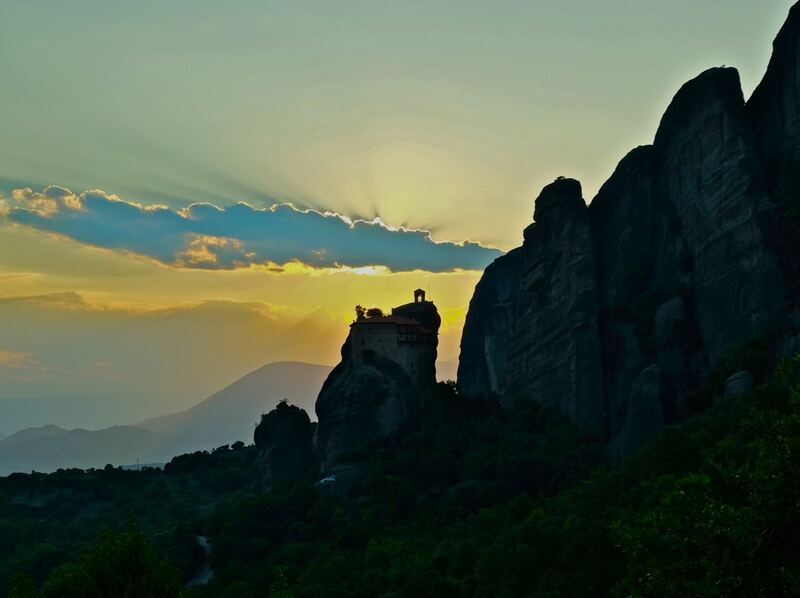 We arrived Meteora from Delphi and the drive was almost 3 hours. Our taxi driver came to pick us up in Athens early in the morning with a stop in Delphi enroute to break up the ride. 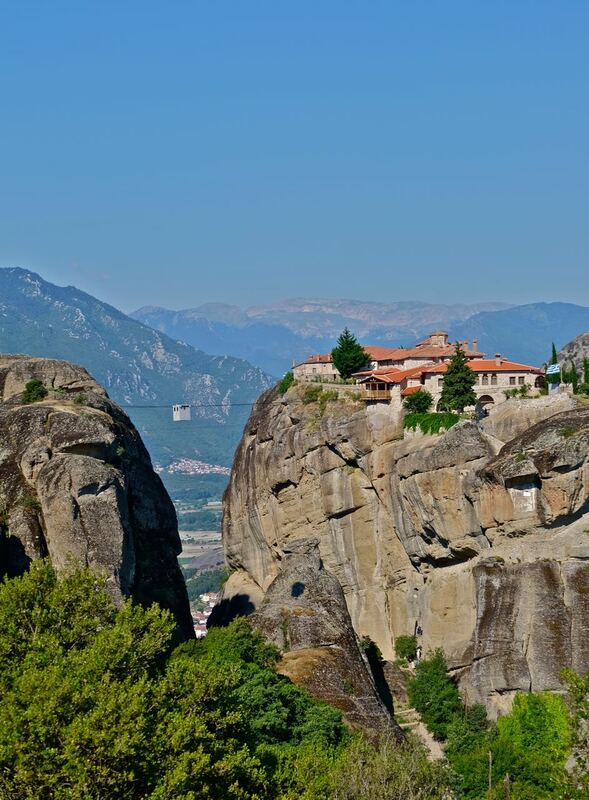 We based ourselves in the town of Kalambaka with easy access to the monasteries above. 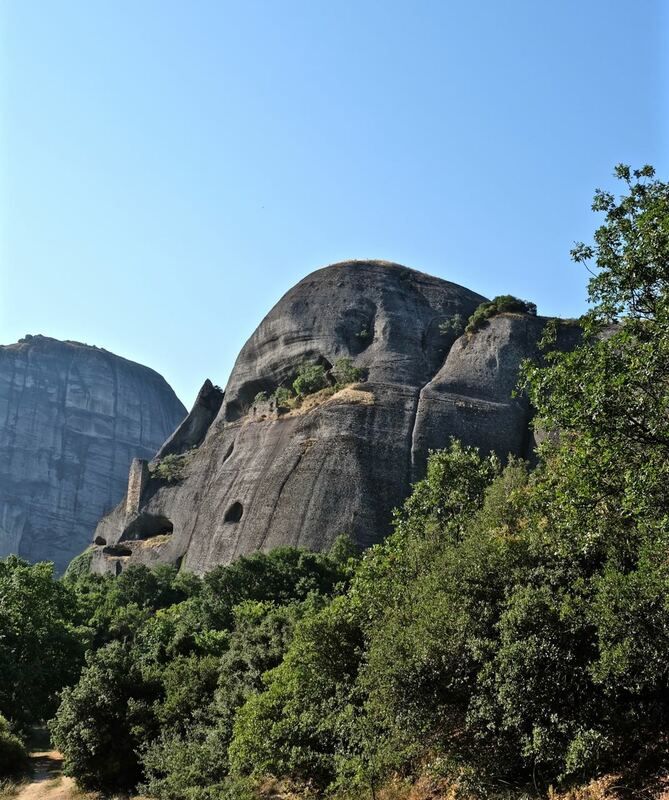 Upon arrival, we took a sunset tour where a guide showed us some abandoned monasteries and hermit caves built into fissures or holes in the rocks. We were also shown the inside of one monastery where the guide explained the architecture and frescoes. Unfortunately, photographs are not allowed inside the chapels. The next day we booked a taxi and the driver took us from monastery to monastery. 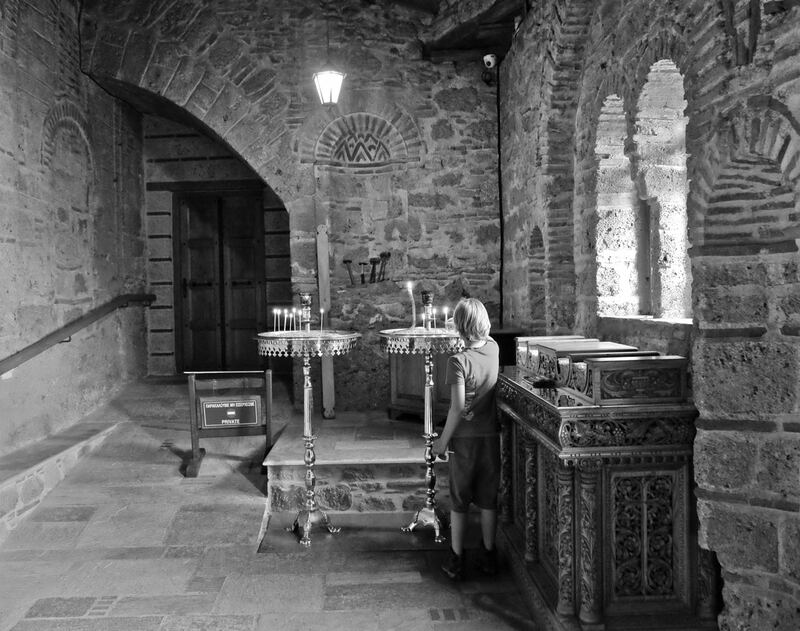 The monasteries all close on different days but are normally all open on the weekends. 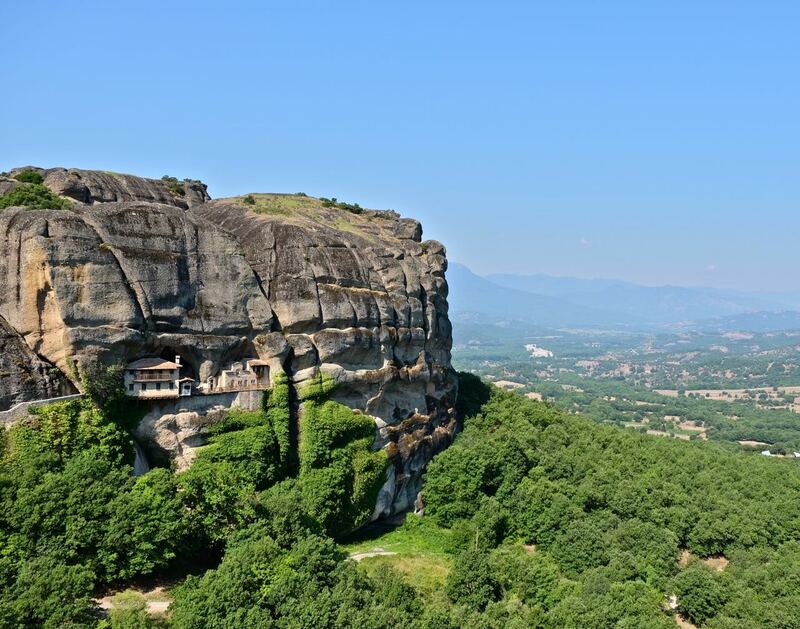 The Great Meteoron – the largest of the monasteries. Rousanou Monastery – my favorite one. Varlaam Monastery in the foreground and St. Nikolaos Monastery, the smallest of the 6 monasteries, in the background. 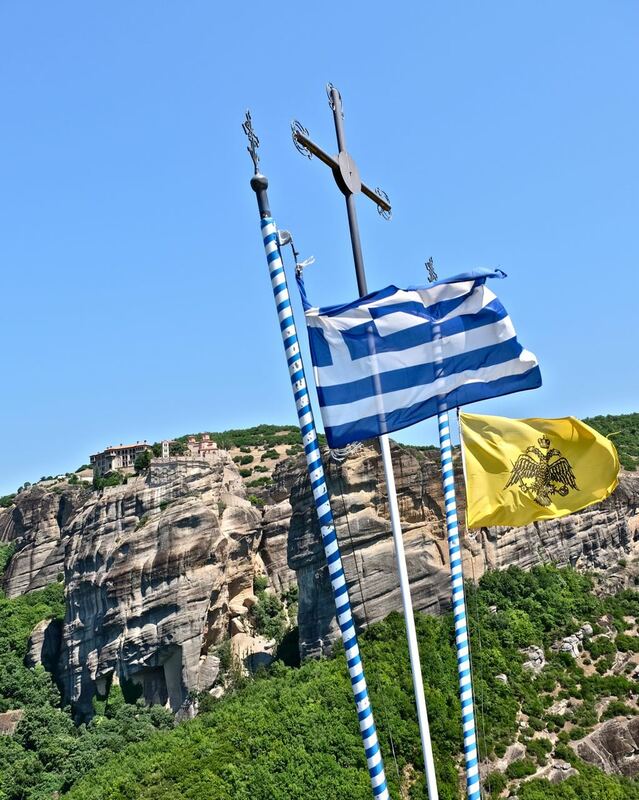 The yellow flag with the double-headed eagle is the symbol for the Greek Orthodox church. One looking towards the Roman Catholic church in the west and the other towards the Islamic church to the east. 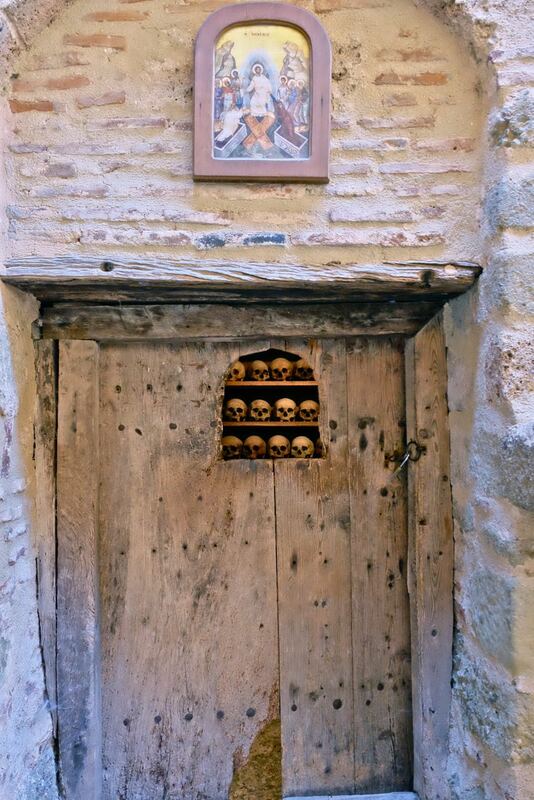 Skulls of the previous abbots are kept in the monastery. 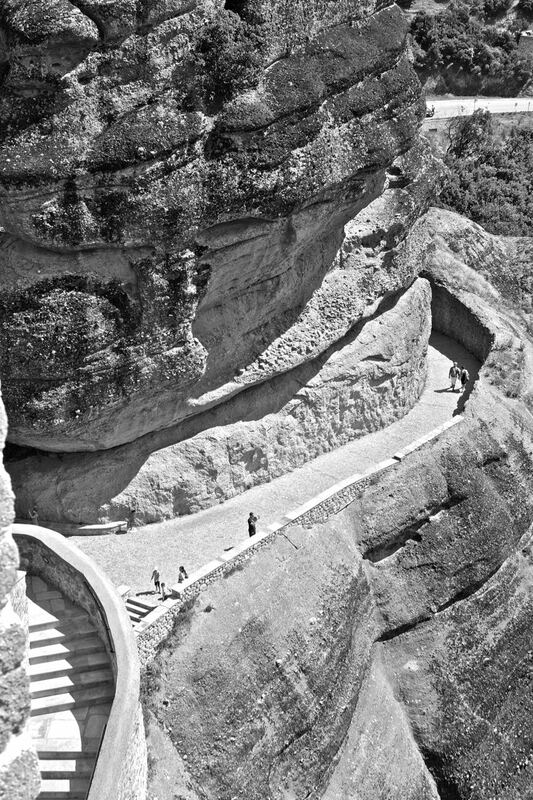 Until the 1920s, there were no roads or stairs up to the monasteries. 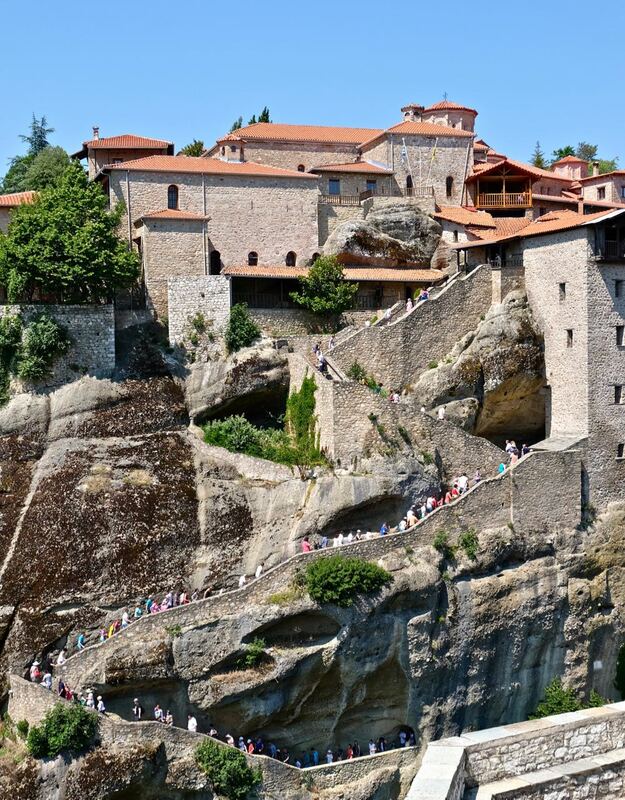 Materials and people were brought up to the monasteries by ladders, large nets, or baskets. 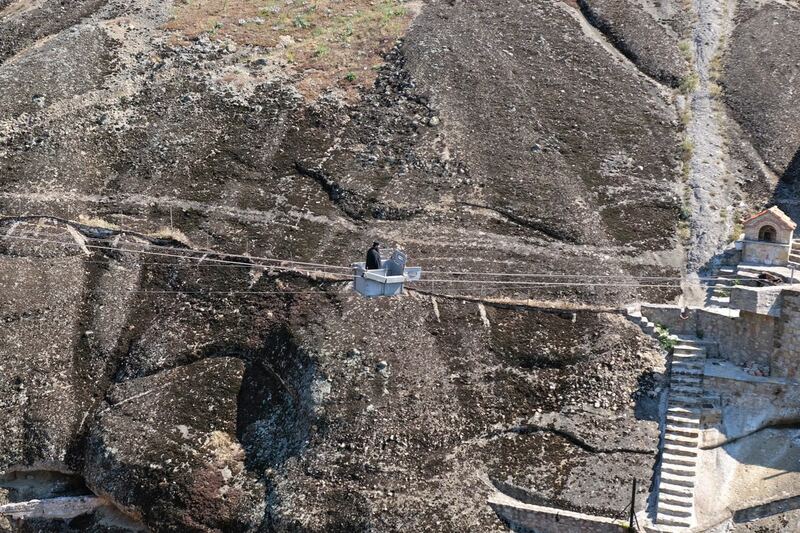 Now elevators as well as cable cars have been installed to facilitate the transport of supplies. Supplies being transported to the Holy Trinity Monastery. Monk getting a ride in the cable car. 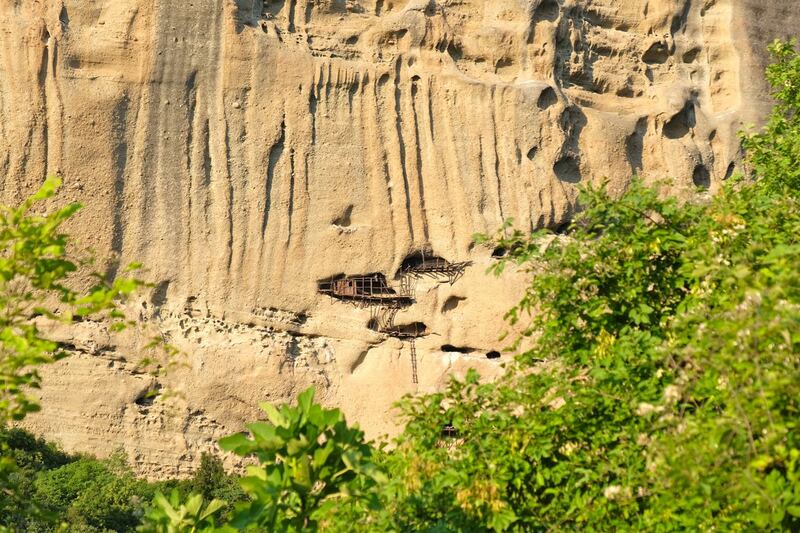 We also did a hike around the rock formations and visited a few hidden or abandoned monasteries. 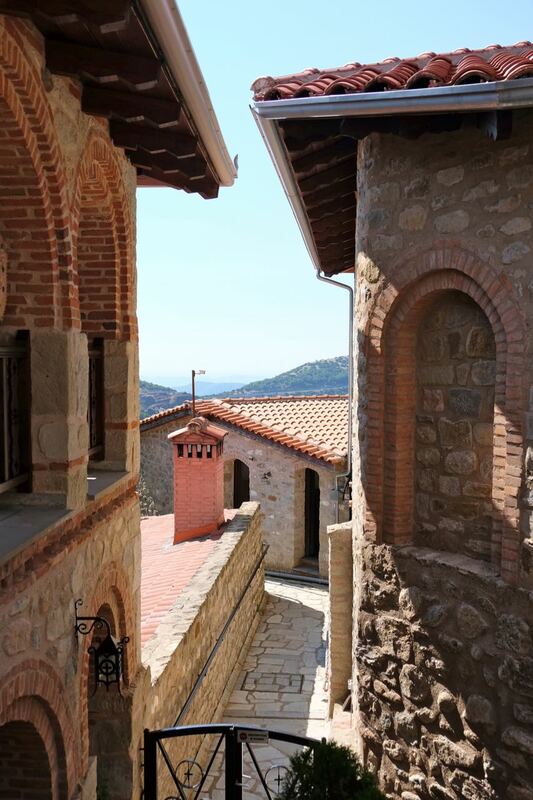 Pantokrator Monastery where only small parts of the monastery walls remain. 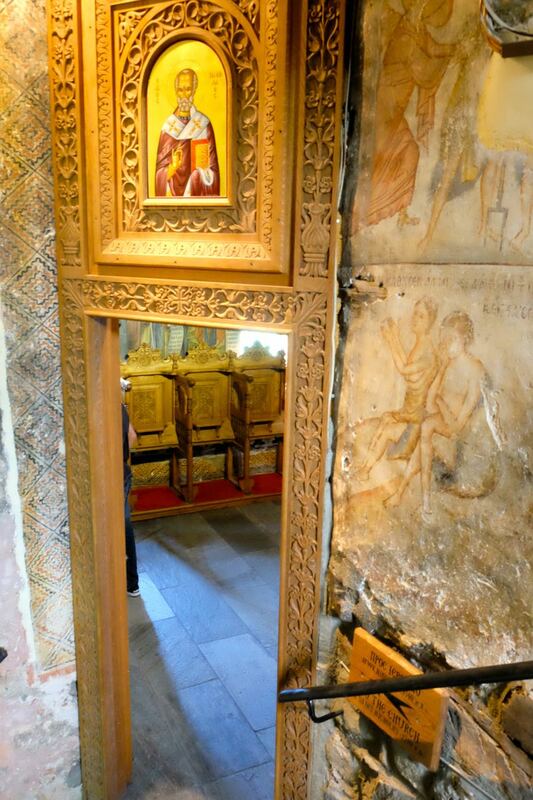 St. Nicholas of Badova has been partially restored but closed. 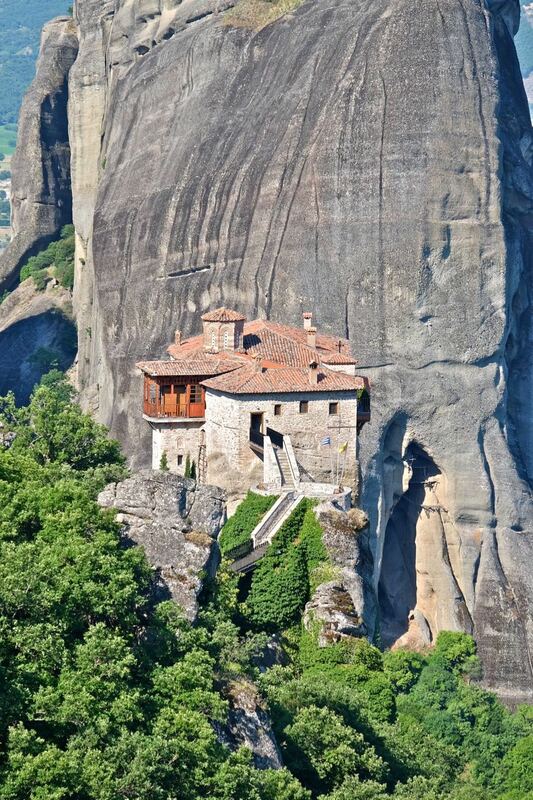 It was built into the large cavity of the rock around 1400 and destroyed during WWII. 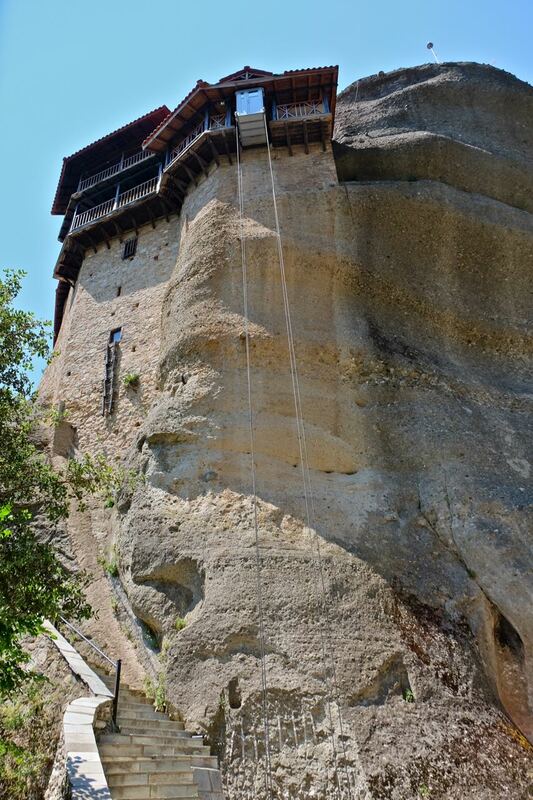 Ypapanti Monastery was constructed inside a cave. It was restored but remains closed to the public. I was told that it is now visited once a year by monks. Abandoned hermitages where hermits lived alone in isolation. 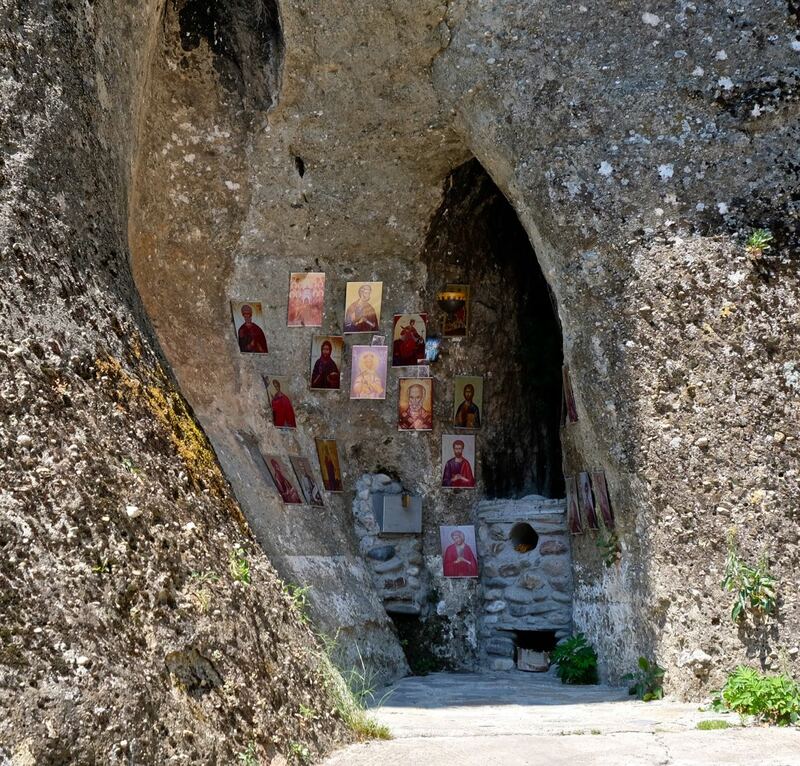 St. George Madilas is a cave dedicated to St. George outside the town of Kastraki. According to local legend, a Muslim was injured and cured by St. George and offered his wife’s head scarf to the saint. 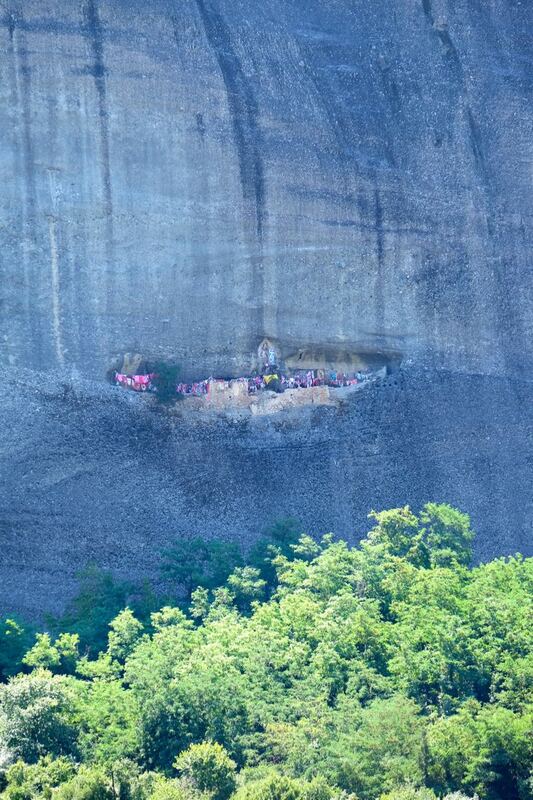 Nowadays, believers hang colorful scarves near the cave’s entrance once a year and leave the scarves until the next year when they are collected as a token of good health. I think 3 days in the area is enough to properly see all the historical sites. Even though it is a bit difficult to get to, it is for sure worth a visit and is definitely one of my favorite places in the world.